As we all know that the Nexus 5 and 2013 Nexus 7 won’t receive the Android 7.0 update. And rest of the other Nexus phone will get this new Android 7.0 Nougat and most of the Nexus users already received this new update on their phones. Nexus 5 and Nexus 7 2013 are not happy with this decision and want to update their phone with the Android 7.0 Nougat. If you are the Nexus 7 2013 user and looking for the way to get this update, don’t worry here is the guide which you use on your phone and update the same with the latest build of Android 7. All credit goes to the XDA developer DevSwift1, who released the Android 7.0 Nougat AOSP 7 Custom ROM for Nexus 7. To get started all you need a Nexus 7 2013 with TWRP or CWM recovery. 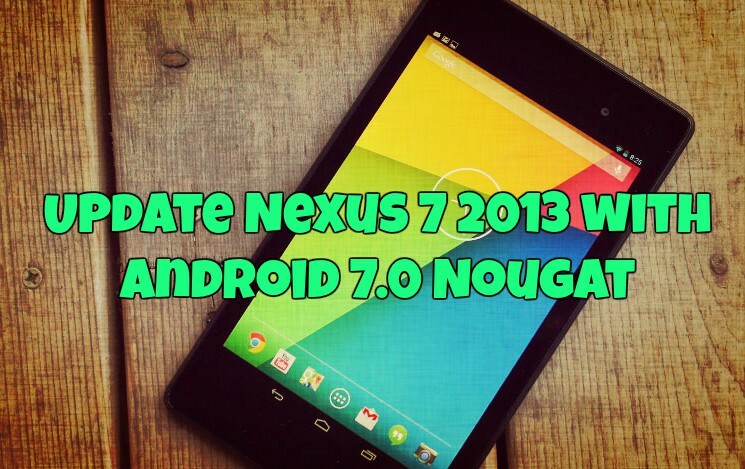 After that follow the below mention guide to download Android 7.0 Nougat on Nexus 7 2013. This tutorial is only for the Nexus 7 2014 users if you are the Nexus 5 user then read this guide to install Android 7 on your device. This one is the Custom Android 7 ROM and not the official release from the Google. Before following the guide do take the full backup of your Nexus 7. Warning: Tecnobuzz.net is not responsible for any damage that might happen to your phone during this process. a) Here is the link from where you can download the Android 7.0 Nougat AOSP 7 Custom ROM for Nexus 7 2013.
b) Download Link for the Gapps to install all the latest Google apps on your device. As per the developer the ROM is based on the latest build of Android 7 and most of the features of the ROM are working fine like Audio, Brightness, GPU Acceleration, Bluetooth, Wifi, GPS, NFC, Location services, Camera and video recording, Video playback, MTP, and Sensors. 1. To get started download ROM zip file Gapps file from above mention links on your phone and remember the location of the files. 3. Now you will see the recovery screen on your device. Tap on Wipe > Advanced Wipe > Select Wipe cache, Dalvik cache, System, and data and swipe to confirm it. 4. Go back to the home screen of recovery. Select Install and locate the Android 7 ROM zip file and swipe to Install the ROM file. After the process completes, Flash the GApps zip file. 5. Once both the files are flashed, wipe cache & Dalvik cache again and Reboot your device. Now your device will boot, and the first boot will take some time to makes the changes on your system. That’s it; now your Nexus 7 is running on the Android 7 nougat.